The hearing on California's suction gold dredging moratorium just concluded in Rancho Cucamonga. Judge Gilbert Ochoa heard arguments from attorneys David Young and James Buchal of behalf of miners seeking to restore the rights of suction gold dredgers after California declared a moratorium on issuing permits. I just spoke with Ron Kliewer, one of our writers, who attended the suction gold dredge hearing in Rancho Cucamonga, California. According to Ron, approximately 120 miners arrived to show their support, but there were only enough seats for 50 or so inside. Some of the miners remained standing at the back of the courtroom while others had to wait outside. Ron felt the judge was much more receptive and attuned to the plight of suction gold dredge miners based on the questions he asked during the hearing as compared to the last hearing conducted in 2013 in his court. David Young and James Buchal "did an excellent job" of laying out the specific problems associated with the moratorium and backed up their opinions with case precedent. In contrast, Ron stated that attorneys representing the State of California and the Karuk Tribe seemed a bit flustered and unorganized. Judge Ochoa is expected to make a decision in about two weeks, and we will certainly post updates here when available. Of course, if the State of California and environmentalists lose, we should expect an appeal. Judge Ochoa asked attorneys representing the state if they can provide a date that the current moratorium will end. The response was, "No, your honor." Although Judge Ochoa said during the hearing he would make a decision in a couple of weeks, Jerry Hobbs, president of Public Lands for the People, stated that the attorneys were called into the judge's chambers after the hearing when most of the supporting miners had already left. Behind closed doors, in a meeting that lasted around 45 minutes, Judge Ochoa ordered the parties to particpate in mandatory settlement hearings starting June 24, 2014. Any decision on the consolidated court cases has been put on hold until after the settlement hearings. Current law and case precedent are in favor of suction gold dredge miners. Both dictate that while the State of California is allowed reasonable regulation of mining, they cannot prohibit mining. 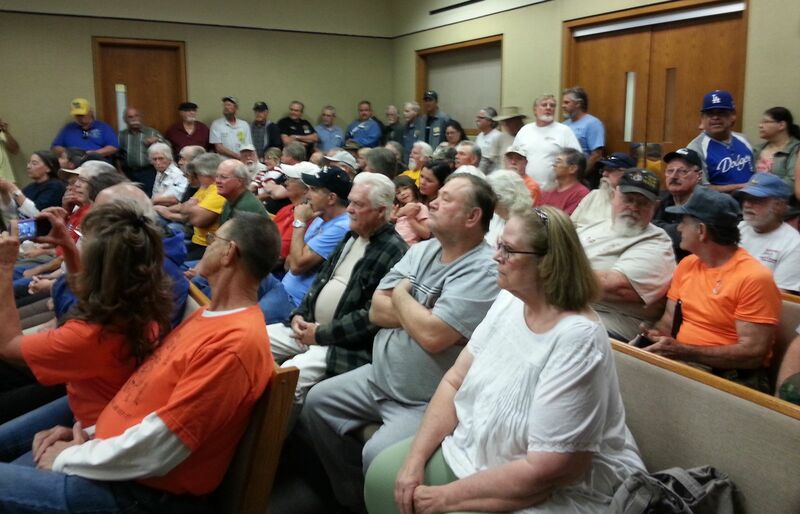 Miners packed the courtroom at the May 1, 2014 hearing regarding the current suction gold dredging moratorium in California. 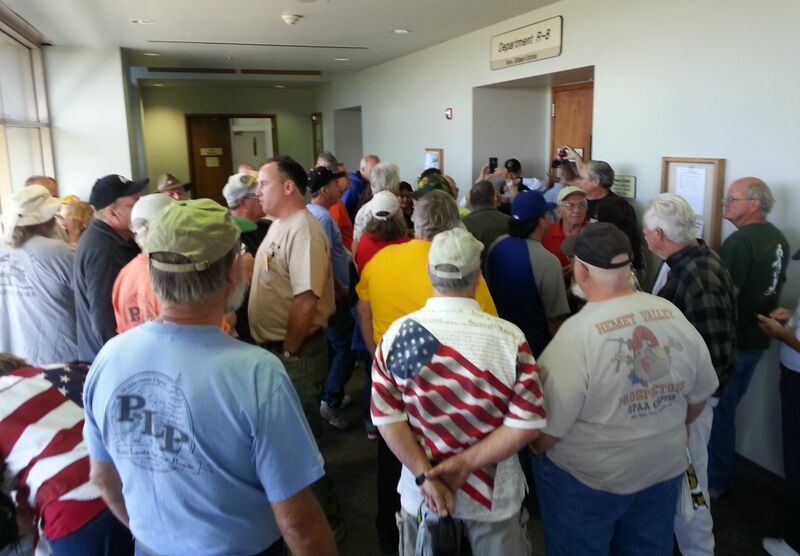 Miners gather to show their support at the May 1, 2014 hearing on suction gold dredging in Rancho Cucamonga.